I am getting an odd screen whenever I miss a call on my Samsung Galaxy S7. If it is a number I know the screen is blue, if it thinks its spam its orange and it says its spam. Anyone know what this is? Welcome to Android Central. Have you downloaded a new phone app? Some have antispam capability and will monitor calls like that. Did you ever get an answer to this? I have it too on my s8+ and it is annoying. Is it a samsung "feature" or something I downloaded? I just figured it out. It is a Samsung "feature" called Call Reminder and you can disable it from the blue screen that pops up after a call. Just hit the 3-dot button in the top right of the screen and turn off "Enable Call Reminder, with ads". Get your shtt together, Samsung. I have something similar on my Droid Z Force but no luck deactivating so far. Plagued me for 2 weeks and removed apps one by one. 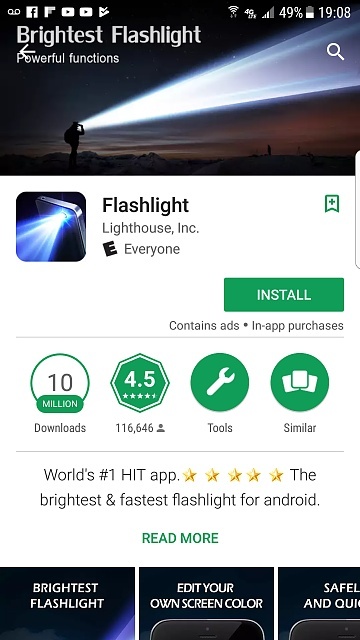 As others suspected, it was a flashlight app. It's gone now. App has an icon that several apps use, so I don't remember precisely which one. Not going to reinstall one to be sure. Looks like this. After a call I get a caller ID notification which is fine but ads are popping up underneath. Is there a way to deactivate the ads? Or the feature. Ads keep popping up on my home screen as drop down round logos..
forgot password on Nexus 10. where can i search to find it? Phone Just reset itself to factory settings on its own !!!! How do I remove gmail account lock on a Samsung Galaxy J3 Prime?